I really don't know why I don't make curry more often. We love it! One of the things I love so much about curries is being able to make it as mild or hot as you want and still so many other flavours to enjoy. Also it's really easy to make up any combination of meats, seafood and/or veggies you want. Sometimes I'll use tofu, delicious! This time I've used chicken. I also added lentils which I don't normally do but it really worked well, adding lots of volume and richness. - In a large pan or wok cook onions and celery in olive oil until the just start to soften, then add garlic and chicken. Cook for about 5 minutes, until chicken is seared. - Add flour and stir to coat everything. Slowly pour in chicken stock, stir in curry paste and allow sauce to thicken. - Pour in the coconut milk, add potato and lentils. Add cumin seeds, celery salt and nutmeg. Simmer for about 15-20 minutes to allow sauce to thicken again and all the flavours to mix. 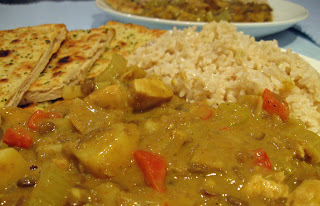 Your curry looks great and it sounds so simple to pull together - definitely my kind of meal!